Food labels on prepared and processed foods have been standardized however, what they say and what they actually mean can be different things. This is the only tool available to help us understand what we are buying but, by no means, is it comprehensive. Reducing the content of ingredients we are concerned about is one thing, telling us what else has been added to make up the difference in taste is another. The following terms are government mandated and pertain to each serving size. Free or without means an amount that is nutritionally “trivial”. For instance: As of January 1, 2006, the U.S. Food and Drug Administration rules on labeling allow foods with less than 0.5 grams of trans fats per serving to claim “zero” grams of trans fats on their labels. That means that Americans who consume three or four servings of these foods in a day will have eaten an extra gram or two of trans fats without realizing it! You need to be aware of this because trans fats, like saturated fats, can raise the risk of heart disease because they increase levels of LDL (bad) cholesterol. The FDA estimates that Americans consume an average of 5.8 grams of trans fats every day. Low or little means low enough to allow frequent consumption without exceeding the “Daily Value” for the nutrient. 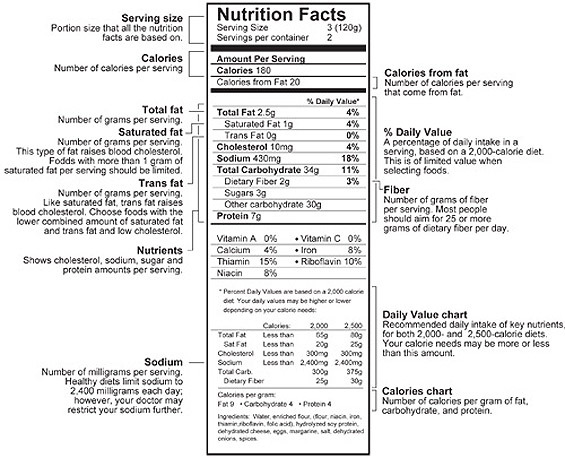 More contains at least 10% more of the “Daily Value” for the nutrient than the reference food it resembles. High, rich in or excellent source means it contains at least 20% “Daily Value” for the nutrient. Good source is between 10 to 19% of the “Daily Value” for the nutrient. Light or Lite is a nutritionally altered product that contains one-third fewer calories or half of the fat of the reference food or 50% of the fat when the food derives 50% or more of its calories from fat. It also can mean that the sodium content of a low-calorie, low-fat food has been reduced by 50%. Calorie free is fewer than five calories. Low calorie is 40 calories or less. Reduced or fewer calories means the product has at least 25% less calories. Sugar free means less than 0.5 grams. Reduced sugar is at least 25% less sugar. High fiber is 5 or more grams of fiber. Good source of fiber is 2.5 to 4.9 grams of fiber. More or added fiber means at least 2.5 grams more fiber. Fat free is less than 0.5 grams of fat. Saturated fat free is less than 0.5 grams of saturated fat and the level of trans fatty acids does not exceed 1% of total fat. Low fat contains 3 grams or less. Reduced or less fat is at least 25% less. Low saturated fat is 1 gram or less and not more than 15% of calories. Reduced or less saturated fat is at least 25% less. Cholesterol free means less than 2 mg of cholesterol and 2 grams or less of saturated fat. Low in cholesterol is 20 mg or less of cholesterol and 2 grams or less saturated fat. Reduced or less cholesterol means it is 25% less cholesterol and 2 grams or less of saturated fat. Sodium free is less than 5 mg.
Low sodium means less than 140 mg or less. Very low sodium is 35 mg or less. Reduced or less sodium is at least 25% less. Light in sodium contains at least 50% less. Lean means the product has less than 10 grams of fat, less than 4 grams of saturated fat, and less than 95 mg of cholesterol per serving and per 100 grams. Extra lean is less than 5 grams of fat, less than 2 grams of saturated fat, and less than 95 mg of cholesterol per serving and per 100 grams.